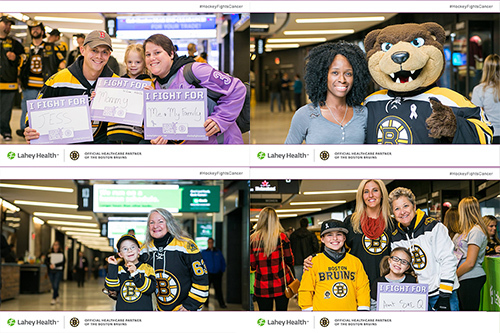 As the Official Healthcare Partner of the Boston Bruins hockey team, our goal is to share health and wellness information with hockey fans in our community and sponsor enjoyable events for all ages throughout the season. Follow us on social media channels and stay in the loop! Lahey Hospital & Medical Center Patients Ride the Zambonis at Hockey Fights Cancer! Two Lahey Hospital & Medical Center patients were treated to a ride on the Zamboni. For John Lema, the ride was a celebration of his hard-fought battle with brain cancer. After surgery and a year’s worth of chemotherapy, John is feeling fantastic and is grateful to his Lahey care team. Read John’s story. For Frank Flahive, who had smoked for many years, the ride was a reminder of the importance of being proactive about health. Participating in Lahey’s CT Lung Cancer Screening program helped saved his life. Watch a video about Frank. If you were at the game and took a photo at the Lahey booth, you can find your pictures here.